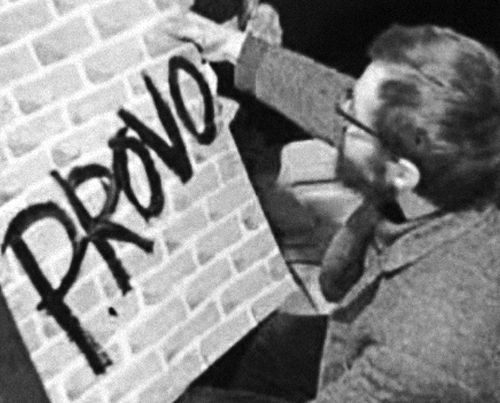 The anarchist movement and counterculture called Provo carried out several actions in Amsterdam and other Dutch cities, attacking the social structures of the state. Provo is a both an artistic and a political movement. 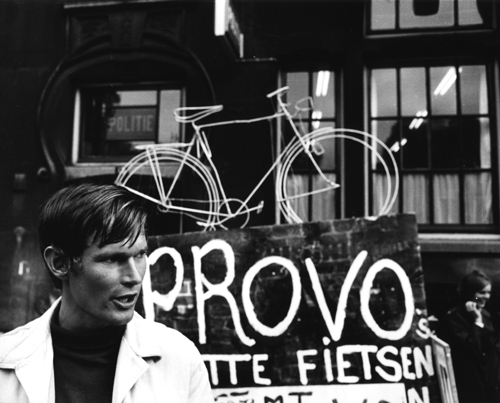 Through their actions they spoke to an entire generation in the Netherlands, and were the predecessors of the hippie movement that was born two years later. Their ideological position focused on issues such as health, environmental conservation and turning private property into public property. Trough humour, cynicism and intellect the group has tried to awaken the critical spirit of citizens to instigate social change. The “White Plans” or strategic proposals for speculative politics on the political scene, drew attention to social problems and aimed to make Amsterdam a more user-friendly city for its inhabitants. The White Bicycle Plan proposed the mass use of bicycles as a means of urban transport in order to reduce pollution; the White Housing Plan encouraged the occupation of empty buildings and apartments in order to solve the acute housing problem. They also worked in other areas, such as opening up spaces for drug use in controlled conditions (predecessors of today’s safe injection sites).